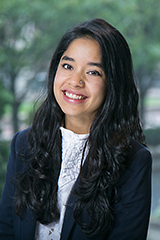 Ria graduated from Columbia Law School in 2017, where she was an LLM Human Rights Fellow. Her work and studies have focused on a wide range of human rights, including economic and social rights, accountability for counter-terrorism practices, mental health and human rights, and the intersection of technology and human rights. At Columbia Law School she was part of the Human Rights Clinic, where she worked on a project to increase accountability for drone strikes and targeted killings, and on the right to mental health in Yemen. She is a human rights lawyer from India, and has practiced in the Supreme Court, High Court and trial courts of India on public interest and criminal defense cases. She has been an active member of the social movement for the Right to Food in India for about ten years.